Envestnet Yodlee Placement Papers PDF Download 2017-2018 | Aptitude, Reasoning & Verbal Ability Model Papers. Good news for the candidates who are searching for the latest placement papers of Envestnet Yodlee Infotech. The article is the correct place to check them. Envestnet Yodlee Placement papers play a crucial role in preparation with Envestnet Yodlee recruitment written test. The current article is a token of help for candidates trying hard to gain a job in the Envestnet Yodlee organization. Candidates who had a passion to work with the Envestnet Yodlee company can go through these placement papers and do practice these to achieve their goal. Aspirants should be aware of the syllabus and also test pattern before attending the Envestnet Yodlee recruitment test. In this page, contenders can check out the latest information about the Envestnet Yodlee placement papers provided with questions and answers of Aptitude, Reasoning & Verbal Ability. We have also discussed the model papers questions gathered from various placement papers of Envestnet Yodlee. Candidates can practice these questions and can test their performance and enhance their knowledge. So that they can perform well in the aptitude, reasoning & verbal ability tests. By practicing more, candidates can easily crack the job in the Envestnet Yodlee drive. Job seekers who are preparing for Envestnet Yodlee recruitment can analyze their level of performance and can estimate their performance in Envestnet Yodlee. This analysis will be helpful for the candidates to improve their skills and perform well in the Envestnet Yodlee online written placement test. For updated information on placement papers, aspirants can bookmark our site All India Jobs. 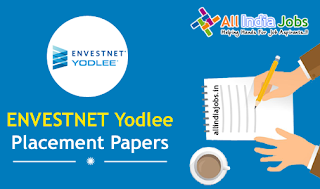 We are also providing Envestnet Yodlee placement papers in the form of PDF Format through online mode. In this page, we have uploaded the aptitude test questions and answers with brief solutions. Candidates can refer these questions before appearing the examination. These will be helpful to get the finest output in the Envestnet Yodlee recruitment test. 1. Two trains, each 100 m long, moving in opposite directions, cross other in 8 sec. If one is moving twice as fast the other, then the speed of the faster train is? Let the speed of the slower train be x m/sec. Then, speed of the train = 2x m/sec. Relative speed = ( x + 2x) = 3x m/sec. (100 + 100)/8 = 3x => x = 25/3. So, speed of the faster train = 50/3 = 50/3 * 18/5 = 60 km/hr. 4. Two men Amar and Bhuvan have the ratio of their monthly incomes as 6 : 5. The ratio of their monthly expenditures is 3 : 2. If Bhuvan saves one-fourth of his income, find the ratio of their monthly savings? Let the monthly incomes of Amar and Bhuvan be 6x and 5x respectively. Let the monthly expenditure of Amar and Bhuvan be 3y and 2y respectively. = (His income) – (His expenditure) = 5x – 2y. => 5x = 20x – 8y => y = 15x/8. 5. How much simple interest will Rs. 2000 earn in 18 months at 6 % per annum? 6. 105 * 99 * 299 = ? Let the distance between the house and the school be d.
8. A can finish a work in 18 days B can do the same work in 15 days. B worked for 10 days and left the job. In how many days, A alone can finish the remaining work? Now, 1/18 work is done by A in 1 day. 1/3 work is done by A in (18 * 1/3) = 6 days. 9. The surface area of a cube is 726m2, its volume is? 11. A can do a piece of work in 4 hours; B and C together can do it in 3 hours, while A and C together can do it in 2 hours. How long will B alone take to do it? Each of the numbers except 54 is multiple of 5. Aspirants who are preparing for the Yodlee Infotech recruitment placement test, they can have a look on these reasoning test questions and answers which will be useful to secure a job in the Yodlee Infotech organization. (b) at (iii) above but has studied Computer Science as one of subjects of curriculum, case may be referred to the Vice President (VP). In each of the questions below, information of one candidate is given. You have to take one of the following five decisions based on the information provided and the criteria and conditions given above. You are not to assume anything other than the information provided in each question. All these cases are given to you as on 1.7.2008. E. if the candidate is not to be selected. 2. A rat runs 20′ towards East and turns to right, runs 10′ and turns to right, runs 9′ and again turns to left, runs 5′ and then turns to left, runs 12′ and finally turns to left and runs 6′. Now, which direction is the rat facing? A directory is a listing of names or things, so (choice b) is the essential element. A telephone (choice a) often has a directory associated with it, but it is not essential. A computer (choice c) uses a directory format to list files, but it is not required.Names (choice d) are often listed in a directory, but many other things are listed in directories, so this is not the essential element. 4. From 2001 to next 10 years the population will continue to grow at the rate 1.79% per year. Note that population in 2000 is estimated at a billion and that in 2011 at 1179 million. The prices of food grains and vegetables have substantially increased due to a prolonged strike call given by the truck owners association. I. The govt should immediately make alternative arrangement to ensure adequate supply of food grains and vegetables in the market. II. The govt should take steps to cancel the licenses of all the vehicles belonging to the association. I is advisable because it will be reduce the inconvenience of the people. II is not advisable because it is an extreme action. The letters in each term are in alphabetical order. The number of letters in each term increases by 1. The gap between the last letter and the first letter of next item increases by 1. 7. AK, EO, IS, ? The letters move 4 steps forward. Fact 3. Mary always tells the truth, but Ann sometimes lies. D. All the statements are facts. If Mary always tells the truth, then both Ann and Mary have cats (statements I and II), and Ann is lying (statement III). So all the statements are facts. 9. Arrange the words given below in a meaningful sequence. ‘P?Q’ means ‘P is not equal to Q’. ‘P@Q’ means ‘P is greater than Q’. ‘P+Q’ means ‘P is smaller than Q’. ‘P©Q’ means ‘P is either greater than or equal to Q’. ‘P$Q’ means ‘P is either smaller than or equal to Q’. ‘P?Q’ means ‘P is equal to Q’. Now each of the following questions assuming the given statements to be true, find which of the two conclusions I and II given them is/are definitely true. Give answer. From equations (ii) and (iii), we can’t obtained any specific relation between H and D. Hence, conclusion I (H ≥ D) is not true. But conclusion II (H ≥ N) follows from equation (iii). 1 + 2 + 1 = 4 and (4)3 = 64. This is a subtraction series with repetition. Each number repeats itself and then decreases by 9. Step VI is the last step of the rearrangement of the above input. bring 63 desk 11 29 together fight 30. Which of the following steps will be the last but one? From the last step it can be concluded that words and numbers are arranged alternately. Words are arranged alphabetically where as numbers are arranged in descending order. When the arrangement of all elements gets completed in a particular step that step is called last step. Step VII is the last step. Hence, step VI is the second last step(penultimate step). 15. 1, 5, 14, 30, 55, 91, ? The pattern is + 4, + 9, + 16, + 25, + 36, ….. i.e. + 22, + 32, + 42, + 52, + 62,….. So, missing term = 91 + 72 = 91 + 49 = 140. We are providing the latest English Test Model papers in the form of questions and answers. We suggest the candidates practice these model papers and get success in the written exam of Yodlee Infotech. 4. I gave him ________ money that I found. 7. His fear ______ he will fail worries him. All except Feathers are organs for movement in different organisms. 9. You are rather friendly _____ the Tans, aren’t you? 13. The traveller being weary/ he/ sat by/ woodside to rest. For our viewers, we have provided the latest updated information for the Envestnet Yodlee placement papers along with a PDF in the above article. We hope the information will be helpful for all the contenders who are going to appear for the written exam of Envestnet Yodlee recruitment. Contenders can check our site regularly for more latest fresh updates.